The Sidebar: From the grave my father haunts "fanatical animal rights group" -- and would PCRM have shut down my father's experiments on beagles that produced the Heimlich maneuver? 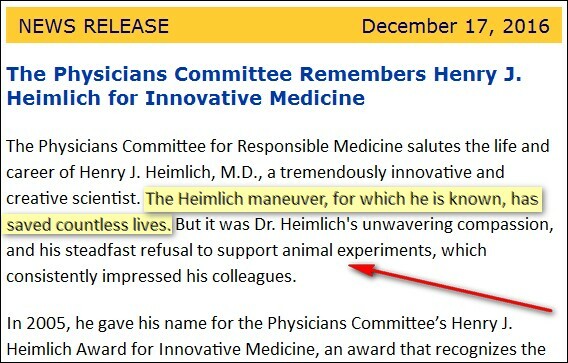 From the grave my father haunts "fanatical animal rights group" -- and would PCRM have shut down my father's experiments on beagles that produced the Heimlich maneuver? I consider PCRM [The Physicians Committee for Responsible Medicine] to be a fanatical animal rights group with a clear cut agenda of promoting a vegan lifestyle and eliminating all animal experimentation. My father joined PCRM in the late 1980s as member of the organization's "medical advisory board." By then, he'd been exiled from legitimate medicine. Among other problems, in 1977 dad was fired for misconduct from his last hospital job and subsequently descended into medical quackery. Nevertheless, he was welcomed with open arms into PCRM by the organization's founding president, celebrity doctor Neal Barnard MD, who's given to wearing a white lab coat in publicity photos. Here are some of his diet books in which he claims "going vegan" will cure just about anything that ails you. Back in the day, presumably Dr. Barnard thought affiliating with a famous name like Dr. Maneuver would boost the profile and credibility of his operation. And for the next few decades things seemed to go that way. But in 2003, as a result of research by my wife Karen and me (and my outreach to reporters), my father was exposed as a dangerous crackpot via scores of mainstream print and broadcast exposes. Some of that stuff hitting the fan has blown back onto PCRM and Dr. Barnard. But the group is throwing a private Hollywood Art of Compassion bash Sunday night to hand out a major award named after Dr. Henry Heimlich, who has been condemned by mainstream medical organizations around the world for his 20-year ("malariotherapy") program of trying to cure cancer and AIDS by injecting people with malaria-infected blood. ...Bill Maher and Alec Baldwin, the two biggest names listed as Honorary Committee Members for this weekend's compassion party, declined through spokespeople to comment to the Weekly. In 2002 the (World Health Organization) called malariotherapy "an example of clearly unscrupulous and opportune research." Five years later, Dr. Anthony Fauci, director of the National Institute of Allergy and Infectious Diseases at the National Institutes of Health, said: "It is scientifically unsound, and I think it would be ethically questionable ... and it does have the fundamental potential of killing you." Now (Peter) Heimlich asks, "How can the PCRM reconcile all that criticism with its position against unethical research? Why won't my father or anyone at PCRM answer that question?" ..."I don't want to discuss the award, or my research," the 90-year-old Heimlich says today. "I don't think I'll be at the party. ... Please contact Dr. Barnard." My father died in December but -- per this Fargo, North Dakota TV expose last week by investigative reporter Bradford Arick-- his ghost still haunts Dr. Barnard's organization. If you were in the area of North University and 12th Avenue, you probably saw about a dozen people holding signs and banners. And you’ve no doubt heard about the Heimlich maneuver to save choking victims. But the group you saw protesting counted the inventor of that life-saving skill as a board member. Our investigation finds Dr. Henry Heimlich passed away last year, but his past is far from clean cut. And the Physicians Committee for Responsible Medicine is promoting what some say is dangerous medical treatment. ...But who is this group? "How does someone look at I’ll say an event like this demonstration and not say well you're not actually a physician's organization, you're just an animal rights advocacy group?” asked Arick. 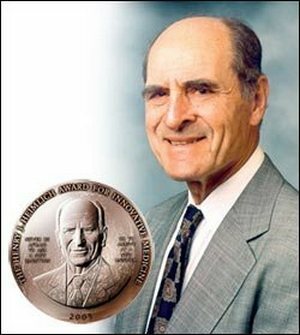 ...On their board until his recent death, the inventor of the Heimlich maneuver, Dr. Henry Heimlich. PCRM promoted using the maneuver as a way to save a drowning victim, something the American Heart Association calls “unnecessary and potentially dangerous”. How is that responsible medicine? ...Further marring Heimlich’s legacy, his belief in Malariotherapy. It’s deliberately infecting a person with malaria as a cure for things like cancer and HIV, and he carried out human trials in Africa, something the World Health Organization and CDC have both denounced. ...There’s another local connection here too. The President of PCRM is Dr. Neal Barnard, and he says he grew up in Fargo. Perhaps the ultimate irony, when dad died in December, a tribute to him was published on PCRM's website. I don't have any expertise or opinions about the use of animals in medical research, but here are a couple of medical ethics brain teasers. Would PCRM have attempted to shut down my father's experiments on the four beagles? Does Dr. Barnard think my father should not have conducted the experiments? For more about PCRM's 30-year relationship with my father, click here.